Anthropomorphism (pronounced ann-throw-poe-MORF-ism) is giving human traits or attributes to animals, inanimate objects or other non-human things. It comes from the Greek words anthropo (human) and morph (form). This could be very obvious: for example, a rock shaped like a human being would be considered anthropomorphic. But anthropomorphism is usually more figurative than that. Anthropomorphism can also be a mistake. For example, some people think that eagles and other birds of prey look angry. But of course that’s just because of the way their eyes are shaped. Birds don’t have the same facial expressions as human beings, so it’s an error to look at an eagle’s eyes and conclude that she is angry – this is anthropomorphizing the bird. Sometimes, we anthropomorphize parts of our own bodies. For example, the common expression “listen to your heart” suggests that the heart speaks to us, which of course is not literally Similarly, people describe conversations between the head and the heart, which is an example of anthropomorphizing (or personifying) these two organs. The simplest form of anthropomorphism is when something is just literally shaped like a human, or literally shown as acting human. A cartoon animal who wears clothes is an example of literal anthropomorphism. Similarly, animals playing the piano or trees talking to each other would be examples of literal anthropomorphism. The calm water hides many secrets. The little town huddled against the exposed cliff face. The underlined words are all things that people do, so they are being used metaphorically in these sentences, and therefore the sentences are examples of personification. This is when a human (or human-like) character stands in symbolically for something else. Unlike personification, this isn’t just a metaphor – it’s an extended symbol that goes to the essence of who the character is. For example, the Greek god Poseidon is an anthropomorphic (human-formed) symbol for the sea, and similarly Aeolus is an anthropomorphic symbol for the wind. So, the sentence “the wind howled” is personification; if there’s an actual character standing in for the wind, such as Aeolus, then it’s not personification but symbolic anthropomorphism. Many theologians and religious scholars argue that the God of Christianity, Judaism, and Islam is an anthropomorphic symbol for benevolence, compassion, or transcendence. Anthropomorphism can also make a story more accessible to children. No one’s quite sure why, but children generally love to see animals and inanimate objects (such as cars or kitchen implements) behave like people. Perhaps it’s just that such anthropomorphism makes the story seem more imaginative and whimsical. Anthropomorphic analogies can also help make an abstract point more concrete. For example, in discussions of foreign policy people often talk of the behavior of whole countries as if those countries were individuals. We might speak of the “friendship” between two countries, or the need to “punish” one country for its aggression or “bullying” of another. Obviously, these metaphors/analogies slightly distort the reality of the situation, but they simplify it in a way that makes understanding easier. Animal Farm is often described as an anthropomorphic tale, since the pigs and other farm animals adopt human behaviors like political debates and, by the end, sleeping in beds. However, in a way this story is the opposite of anthropomorphism! Since each animal is a symbol for a real human being or social group (Snowball = Leon Trotsky, Boxer = the working class, etc.) this is really an example of giving an animal form to a person, rather than the other way around! Nonetheless, animals speaking human language is literal anthropomorphism, so it’s reasonable that people talk about Animal Farm in this way – it’s just more complicated than most other examples. G. Wells’s The Island of Dr. Moreau is all about a mad scientist who literally anthropomorphizes animals – he performs experimental surgeries on animals to make them more like human beings. The book deals with themes of cruelty and animal rights, and attempts to blur the line between human and animal while at the same time showing that there are fixed limits to Dr. Moreau’s quest: we can only make animals so much like ourselves before their true nature asserts itself. Neil Gaiman’s American Gods uses countless symbolic anthropomorphisms. In the novel, the ancient gods are all real, but have come into competition with modern gods, which are the anthropomorphic forms of technology, media, etc. There are also gods from other eras, such as one representing railroads. These anthropomorphic symbols, and the relationships between them, allow Gaiman to make a statement about modern lives and values through his story. 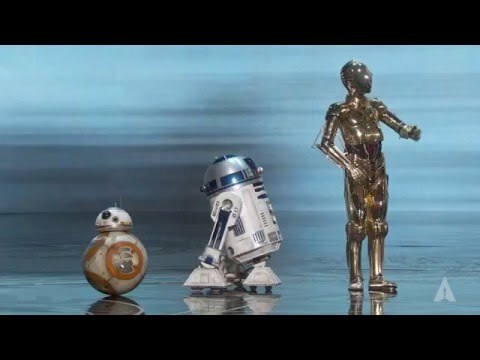 The droids from Star Wars exemplify different forms of anthropomorphism. C-3PO is anthropomorphic in the literal sense (he’s shaped like a human), but in his mannerisms and personality he’s much more stiff and robotic. R2-D2, on the other hand, is not remotely anthropomorphic in his shape – but his personality is very relatable and human! Fables and cartoons use anthropomorphism all the time. 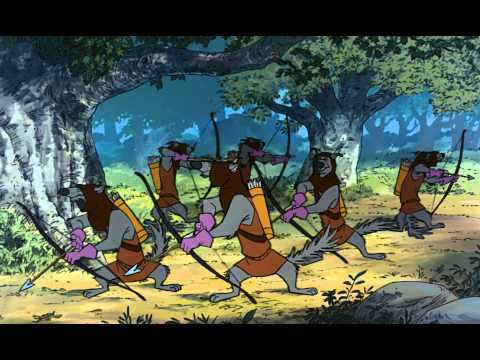 In Disney’s Robin Hood, for example, all the characters are animals – but they live in castles, fight with swords, wear clothes, and in all other ways act like humans. These are all examples of literal anthropomorphism. The opening lyrics to this Green Day tune anthropomorphize time. In this metaphorical anthropomorphism (personification), time is portrayed as a somewhat demanding, overbearing leader. We have little choice in the matter – we must simply follow where time directs. This is clearly not a literal statement, and since there’s no explicit comparing language it must be a metaphor rather than an analogy or simile. I’m a dragon in the morning if I don’t get my coffee. I’m as irritable as a dragon in the morning if I don’t get my coffee. It is the East, and Juliet is like the sun!